Yorshka is the leader of the Blade of the Darkmoon covenant. 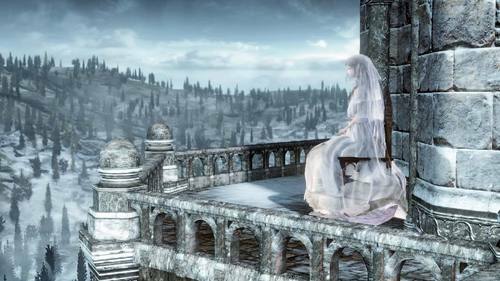 She sits atop the Prison Tower that rises above the Church of Yorshka in Irithyll. For the "Gwynevere, Queen of Lothric" theory, please refer to this page. EDIT: This theory is almost certainly disproved because the third child of Oceiros is referred to as male. For more information, check out this theory video: https://www.youtube.com/watch?v=1PQ4E3dzC7g. A theory exists about Dark Souls 1 that Crossbreed Priscilla was the child of Seath the Scaleless and Gwynevere. This theory is available for reading here. King Oceiros "was obsessed with creating a worthy heir, and when this proved impossible, resorted to unspeakable means". Him having turned into a dragon-like creature is likely a result of his experimentation with dragons and humanity. Yorshka's Chime reads "Her brother, the former knight captain, presented her with this medium together with another gift: her name." "Brother" here may not necessarily mean blood relation, as both Gwyndolin and Yorshka refer to Gwyn as father and to Gwynevere as sister, and it is safe to assume that the Darkmoon Blades refer to each other as brothers and sisters in arms. The fact that she was given a name along with the gift suggests that she had to conceal her identity and take on a new one. Another interesting thing to look at is Oceiros' dialogue. He clearly states that Ocelotte is a child of dragons and from the way he talks about him, it implies that Ocelotte also possessed the ability to turn invisible, just like Priscilla. Priscilla and Yorshka seem to have a lot of similarities; scales on their faces, tail, being able to turn invisible. On top of this, Yorshka and Oceiros seem to have the tentacles in common, while Yorshka's arms seem to be similarly long and weak like Prince Lothric's, who is presumed to be the son of Oceiros. 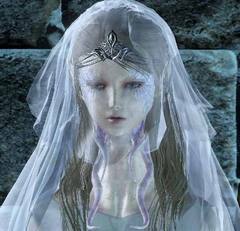 Oceiros refers to Ocelotte as male, but it is possible that when Gwynevere left, she took Ocelotte along and trusted Gwyndolin with bringing him up. Having to conceal his identity, it can be speculated that Gwyndolin raised Yorshka the same was he was raised, and to be the next leader of the Darkmoon Blades. It is worth mentioning that Oceiros was infatuated with the search for moonlight, and although it is a stretch, one can comtemplate the possiblity of Ocelotte having an affinity of the moon, thus raised as female, or simply disguised as female. and considering Oceiros has gone mad, it's not impossible that he was mixing up his children. Ah, you ignorant slaves. Finally taken notice, have you? Of the power of my beloved Ocelotte, child of dragons. Well, I will not give him up, for he is all that I have. Ahh, dear little Ocelotte. Where have you gone? Are you hiding from me? Come out, come out! Don't be afraid! You were born a child of dragons, what could you possibly fear? Now, now, show yourself Ocelotte. My dear, little Ocelotte. There is a youtube video which shows that the Consumed King is supposed to hold the real baby, which is presumably Ocelotte. For more info, search for "Dark Souls 3 ► The Mystery of Ocelotte (IN-DEPTH LORE)" on youtube. Thanks for that! I'll be sure to incorporate the information on this page.